Submitted by Alexander Briones on May. 22, 2018. This guide was originally published on Mar. 21, 2017 and last updated on May 22, 2018. Getting a wireless system for your guitar can free you up from being tied to your amplifier and reduce cable clutter on stage. To keep up with changing times, we have updated this guide to feature what the market currently considers as the best wireless guitar systems. This time around, we short-listed 23 of the most popular wireless systems at major online American music gear stores and examined over 4,300 review and ratings sources to bring you the highest rated options on the market. 89 out of 100. Incorporating 900+ ratings and reviews. 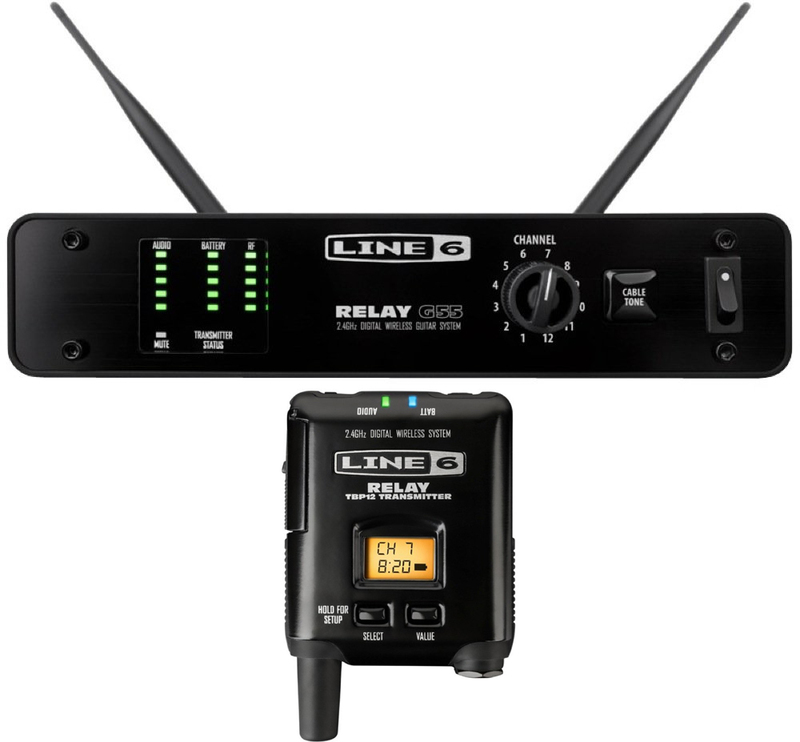 The Line 6 Relay G10 is streamlined wireless system that utilizes modern 2.4 GHz frequency. There's no need for any complex setup and menus, all you have to do is power up the receiver and plug-in the bug-type transmitter to your guitar. It has an operating range of 50' which is good enough for most applications, while the built-in battery of the transmitter runs for up to 8 hours per charge (200 hours standby time). Finally, charging the transmitter battery is as simple as plugging it into the receiver. Output: 1 x XLR, 1 x 1/4"
Features: Streamlined design, Bug Type Transmitter charges on the receiver by simply plugging it into the receiver. The main point of wireless systems is to replace clunky and high maintenance cables, and the Line 6 Relay G10 does this well while keeping operation as simple as possible. Its plug and play simplicity continues to win over users, while its sound quality impresses even experienced players. It's compact profile and the ability to charge the transmitter right on the receiver is also often complemented in reviews. 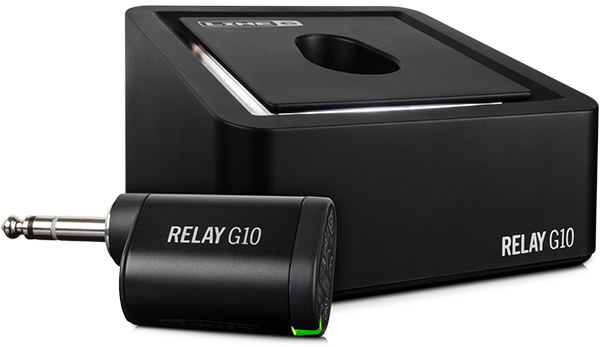 Being affordable is another plus that makes users really happy with the Relay G10. There are some who had issues with the receivers power adapter, which is a USB cable, much like the ones used for charging Android phones. There are reports of the cable being flimsy, and loosing contact after multiple setup and tear downs. Some recommend getting a better micro USB cable for improved reliability. If you want a simple and affordable way to free yourselves from guitar cables, then the Line 6 Relay G10 is for you. 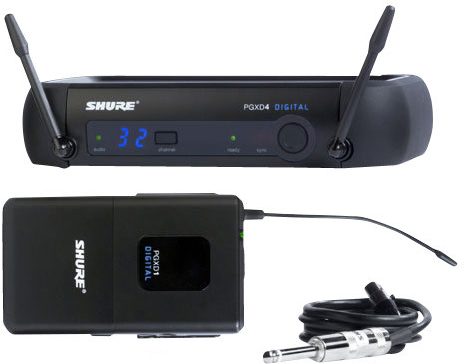 While they are mostly known for quality microphones, Shure is also a market leader when it comes to wireless systems. And the BLX14 is one of their more popular offerings, featuring a traditional combination of bodypack with specialized guitar cable and a single channel receiver. To simplify setup, Shure equipped the BLX4 with their "QuickScan" technology, which conveniently sets up the wireless system for you, in unused frequencies. Speaking of frequencies, the BLX14 is available in four variations, each one working on different bandwidths. Dimensions: 4.3" x 2.51" x 0.82"
Dimensions: 1.57" x 7.4" x 4"
Value for money seems to be its most praised attribute, but reliability also comes up often. There are even some users who report using their BLX14 system for many years without issue. Ease of setup is also complemented, along with the solid feel of both the receiver and bodypack transmitter. Not many complaints reported, other than a few who rated it slightly lower, but still comment positively. The Shure BLX14 is a budget-friendly wireless system from a reputable brand, heed market recommendations and check it out. Audio-Technica decided to follow the latest trend in wireless connectivity with the ATW-1101G, utilizing the 2.4GHz frequency range which most modern wireless devices use. The System 10 receiver scans for the best available frequency (or open channel) to avoid interference, and configures the transmitter accordingly. As proof of its intuitive design, there are no extra controls on the front panel, other than buttons for pairing. The system also lets you label pairings with different numbers so you know which is which in case you have multiple System 10's running at the same time. Note that the operating range for the ATW-1101G is shorter at 100 feet, but it should still be more than enough for most stages and setups. Guitar Cable: Hirose 4-pin to 1/4"
Dimensions: 2.76" x 4.21" x 0.98"
Dimensions: 7.48" x 1.82" x 5.06"
Most of the compliments are directed toward ease of use and quick setup. The unit's sound quality and clarity also get a lot of positive remarks from users, including non-guitar playing musicians like bassists, who find the quality of the sound to be more than adequate. There are a few users who report interference issues, but repeating the pairing process helped. There are also some concern over the transmitter's battery life, specifically when using NiMH rechargeable batteries. If you're looking to go the digital wireless route without spending too much, then the Audio-Technica ATW-1101/G wireless system is ideal. There's no denying Shure's dominance in the wireless market, thanks to their reputation for both quality and reliability. So it's not surprising at all to find their brand securing multiple slots in this list, which include the PGXD14, a digital wireless guitar system that operates in the UHF frequencies, and streaming 24-bit/48kHz quality digital audio. To be specific, this system operates in the 900 MHz range, with up to 5 compatible channels per frequency band. Speaking of channels, the streamlined interface lets you select your preferred channel, or have the unit pick one for you via the sync button. The receiver has two fixed antennas that allow for true digital diversity signal reliability. The transmitter has its own antenna and a mute button. Dimensions: 4.25" x 2.52" x 0.75"
Dimensions: 1.6" x 7.125" x 4.1"
Many guitarists rated the Shure PGXD14 highly because of its sound quality. And it's not just limited to standard 6-string guitars because some of the positive reviews were written by satisfied bassists. Heavy duty build and reliability are also prominent mentioned, a testament to Shure's reputation for reliability. There were a few users who want the receiver to be rackmountable. Some find the price to be a bit on the high side, although they still gave high ratings. If reliability is high in your list of considerations, then consider the Shure PGXD14. Shure's GLXD14 exemplifies how many musicians prefer simplicity and quality over extra features when it comes to wireless guitar systems. The GLXD4 receiver is as straightforward as it can be, sporting a familiar table top profile that's free from bells and whistles. 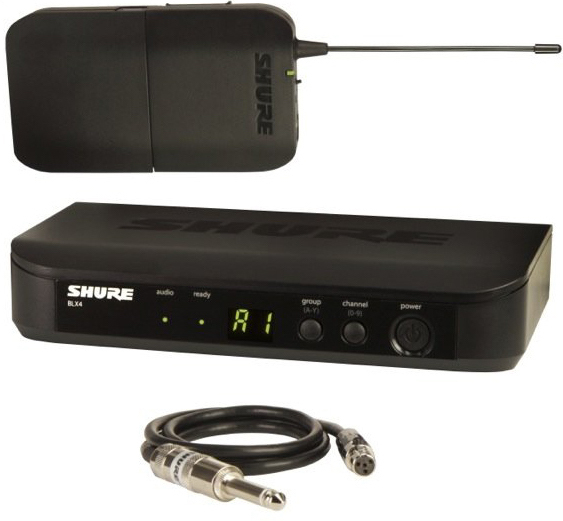 It's only purpose is to wireless connect your guitar to your rig, and it does so via Shure's LINKFREQ technology, which automatically syncs the transmitter and receiver to open channels. The Instrument friendly GLXD1 transmitter is powered by Shure's rechargeable Li-Ion battery, which allows for up to 16 hours of use. Both the receiver and transmitter seamlessly change channels when needed, without having to breakup your signal and your performances. Dimensions: 3.56" x 2.54" x 0.9"
Dimensions: 1.6" x 7.2" x 4.6"
Shure GLX-D continues to exceed the expectations of many users, to the point that even experts find themselves in awe of its sound quality and real-world reliability. Many describe the sound as crystal clear and dynamic, while others are surprised to hear details and nuances that are usually lost with a wireless system. Also prominently reported is its quiet operation, which stands out for many users who have had bad experiences with other wireless systems. Some professional musicians give this system lower scores because the receiver is not rackmountable. There are a few users who comment that the resulting sound is subtly brighter compared to when they are using cables, but this maybe due to more sonic details going through. 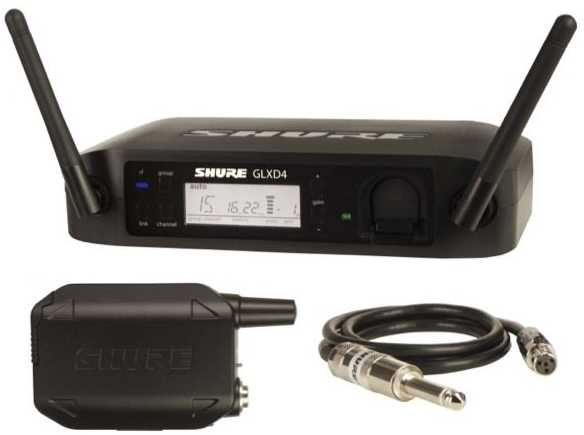 If you want what the market considers as the best wireless guitar system, then get the Shure GLXD14. 93 out of 100. Incorporating 375+ ratings and reviews. Of the many wireless systems for instruments and guitars, Shure's GLXD series continues to be rated highly. This includes the GLX16, with its pedal shaped wireless receiver. The receiver operates in the 2.4GHz frequency band and allows for up to 8 compatible systems simultaneously. It utilizes Shure's LINGFREQ technology, which identifies open channels and configures the system accordingly. Since the transmitter automatically links to the receiver, setup is quick and convenient. It also has a nifty built-in tuner that you can engage via the foot switch. 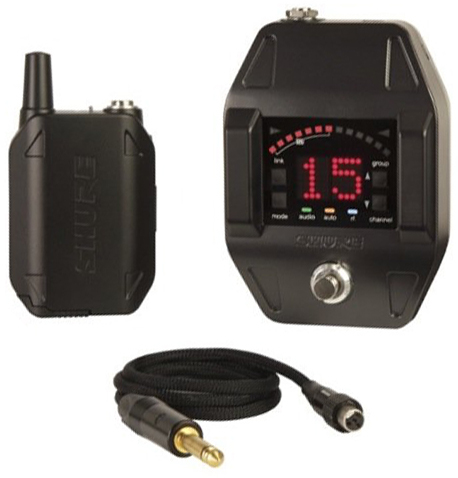 Speaking of the transmitter, the GLXD1 bodypack is powered by Shure's 3.7V Li-Ion Rechargeable battery, and it can run for up to 16 hours when fully charged. If you're worried about the charge time, the company assures that 15 minutes of charging will give you roughly around 1.5 hours of operation, more than enough for the typical gig. Dimensions:1.8" x 3.7" x 5.2"
Flawless, is a superlative that many users use to describe the Shure GLXD16. Most users are impressed with its sound quality, to the point that some report it to be similar sounding to expensive guitar cables. The system's signal reliability and robust build are also complemented multiple times, by musicians who play different types of guitars, basses and other instruments. There are a few who felt that the transmitter guitar cable is a bit flimsy, while others found the cable to be too long for bodypack use. A few guitarists who play in big-band settings complained of signal drop-outs, possibly due to the GLXD16's limitation of up to 8 per frequency band. The GLXD16's pedalboard friendly form factor and Shure's reputation is a sure win combination, worth the investment for those who want the best pedal wireless guitar system. 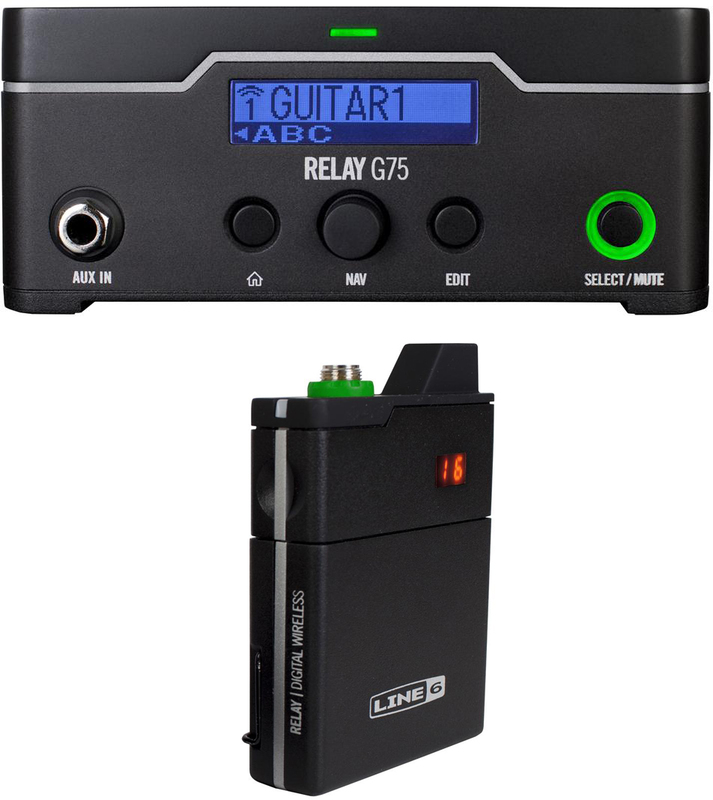 Drawing from their digital audio processing expertise, Line 6 continue to produce reputable wireless systems that are specifically designed for guitars, of which the Relay G55 secured them another spot in this list. This wireless system features the 4th iteration of the company's wireless technology, utilizing the 2.4GHz bandwidth at 24-bit digital conversion. It also features DCL (Digital Channel Lock) Technology which improves signal clarity and stability by blocking out third-party signals like, Wi-Fi routers, mobile devices, laptops and more. The dynamic range, and frequency response of this system is said to be tweaked to better accommodate guitars and basses. There's also a nifty feature called "Cable Tone" which emulates the high-frequency roll-off characteristics of physical guitar cables. Guitar Cable: TA4M to 1/4"
Dimensions: 4.7" x 6.4" x 2.9"
Dimensions: 1.75" x 7.5" x 8.2"
One reviewer describe the Line Relay G55 as an awesome wireless system, and it is a good adjective that summarizes of how many users feel about their unit. While most of the positive reviews are from guitarists, bassists also report no-hiccup performances with both standard electric bass and even upright ones. One user put the G55 system to the test by running the system on a parade, and it passed with flying colors, considering that there would've been a lot of interference as they moved through streets. Durability are also prominently mentioned by those who have used the system for years. There are a few users who are concerned about the guitar cable, and one even recommended buying a back-up cable from Line 6 just to be on the safe side. Thanks to companies like Line 6, amp modeling technology continue to expand into other gear, including wireless guitar systems. Case in point is the Relay G75 with its Cable Tone Technology, which adds back the subtle high-frequency roll-off effect that real guitar cables add to the overall tone. But it's not just about cable modeling because it is well received for its tour ready hardware, modern 2.4GHz operation, and battery saving feature. Speaking of batteries, the transmitter runs on regular or rechargeable two AA batteries, which gives you over 8 hours of use, standby time is extended by the transmitter's smart power saving feature. Dimensions: 6.2" x 2.63" x 4.65"
Value for money comes up often in reviews, while others are impressed with its reliability. Most users are impressed with its overall build quality, with some even reporting that the Line 6 Relay G75 is the best wireless system that they have tried. Ironically, there aren't many who report on Line 6's Cable Tone Technology, but there are no negative reports either so it's not much of a big deal. However, there are some who feel that the transmitter eats up batteries too quickly, they recommend investing on good rechargeable batteries for convenience and for long term savings. Whether you're into Cable Tone Modeling or not, the Line 6 Relay G75's reliability and sound quality is well worth the investment. On July 13, 2020, the FCC's new frequency use regulations will take effect, forbidding the use of 617-652 MHz and 663-698 MHz, in order to meet increasing demand for wireless broadband services. This means that wireless systems that operate within the said frequencies will be illegal to use in the United States. So for this update, we only included those that operate within allowable frequencies, to ensure that they are compliant to FCC's new regulations. For further reading on this subject, head over to the FCC consumer guide. Analog Wireless Systems are still commonly used, thanks to their range, practicality and accessibility. They transmit your analog guitar signal via VHF(30MHz to 300MHz) or UHF(300Mhz to 3GHz) frequencies, much like analog radios would. Since VHF frequencies are being used by TV and Radio stations, they are more susceptible to interference, which means that they can only be viable in areas with low VHF interference. On the other hand, UHF is less crowded and allows for more wireless systems to operate simultaneously. Still they are limited by the various location-specific UHF frequency regulations. Digital Wireless Systems are considered industry standard, because of their secure digital encryption and improved resistance to interference. It also helps that most of them operate on globally unlicensed frequencies, much like Wi-Fi routers (although there are still some digital wireless systems that operate in UHF). They are easier to setup and use with their automatic frequency detection and grouping features. On the flip side, digital wireless systems are more expensive, but they are getting more affordable as production and market competition increase. While wireless systems now use frequencies more efficiently, there will still be a limit to how many wireless systems can work together within the same frequency range. This is important when setting up multiple wireless systems that work simultaneously. Thankfully, some analog systems are produced with different frequency bands, to ensure they don't clash with other systems. Digital systems can be configured to choose clear channels to avoid this problem, but there are specific limitations to how many you can use simultaneously. You also have to consider other radio emitting devices that may introduce interference to your system, this include TV, microwave ovens, radio communication devices and more. To help with this, some wireless systems can scan the frequencies and use ones with the least interference. Based on the specifications, analog systems have more range, which means that you can move further from the receiver. Still, the range offered by digital systems are usually more than enough to cover even big stages. Note that solid objects between the receiver and transmitter can decrease the range. We have included the ideal maximum range of each wireless system, to help you find one that suits your need. Wireless receivers come in three form factors - table top, rackmount and pedal. You'll want one that will integrate easily into your existing rig. Best to have one in pedal form if you don't have other rackmount gear, and the reverse is true if you tour professionally and want the security and reliability of rackmount gear. Some table top wireless systems are convertible to rackmount via optional mounting kits. Transmitters mostly come in belt/body pack form, and they connect to your guitar via a short cable. There are bug-type transmitters that connect directly to your guitar. Ideally, sound difference between using a cable and a wireless system should be negligible, but this is not always the case as we've seen on some reviews. For this reason, some wireless systems come with tone shaping elements, emulating guitar cables by subtly trimming the high frequencies. While sound quality in general is subjective, review ratings can be a good indication of good quality. While gathering review data, we found that the transmitter guitar cable is usually the weakest link in wireless guitar systems. And since they are mostly specialized cables which you can't just buy off the shelf, you'll want to take good care of them while in use, and store them properly. While these are not necessarily important, having extra features can add value to the wireless system, and even allow you to let go of some of your existing gear. Common guitar friendly features include built-in guitar tuner and mute. For this update, we looked at all top rated and popular wireless guitar systems that are sold by major retailers in the USA, and we ended up short-listing 23 and you can see most of them in the Music Gear Database. We then gathered over 4,300 relevant sources, which include the most current reviews, ratings, feedback, recommendations and more. All of these were then processed via Gearank's algorithm, resulting in scores that reflect current market sentiments. We used these scores to narrow down the list to the top wireless guitar systems. Finally, we arranged the list by price, and added important descriptions, specifications and noteworthy pros and cons for each of the wireless systems that made the list. For more information about our processes see How Gearank Works. Submitted by John k (not verified) on Aug. 2, 2017. Submitted by Jason Horton on Aug. 3, 2017. Interesting point - but was it the actual system that made a difference, or was it because when you changed systems you also changed the frequency you were using? Submitted by Baba Claxton (not verified) on Aug. 27, 2018. Could be, but I too have had dropout issues using 2.4gHz wireless in high wifi areas like casinos, and my old Sennheiser G2 system has been flawless in those and all situations. Submitted by Jason Horton on May. 22, 2018. 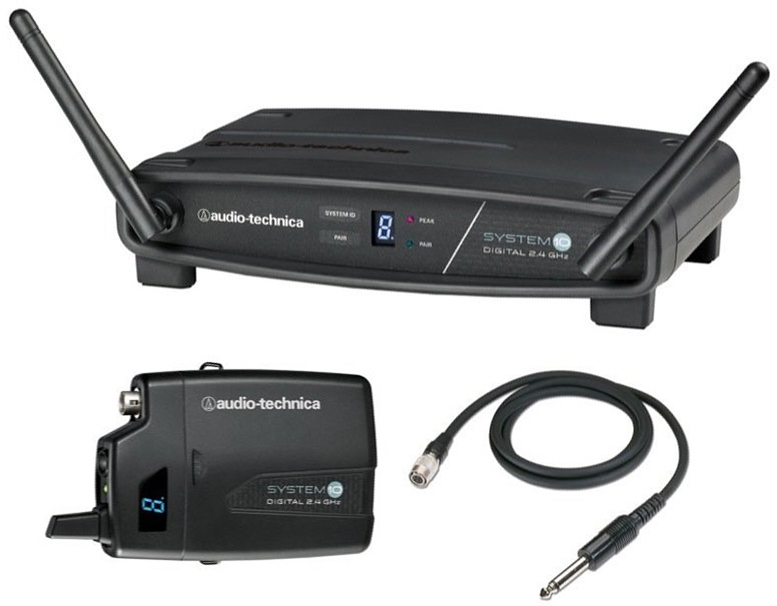 As a result of today's update to this guide, the following wireless system was removed from the recommended list above: Audio Technica ATW-1501. The following system has been removed from our recommended list above due to a lack of availability: Sennheiser XSW 72 Instrument Set. Today we removed the following from the recommended list above due to being discontinued, but you can still read our analysis of it: Sennheiser EW 172 G3.